Our Slide-in Spa was designed in consultation with the input of gerontologists, ergonomists and occupational therapists from the British Columbia Institute of Technology (BCIT Study Results) and Simon Fraser University’s Gerontology Research Centre. Aquassure’s Universal Spa is also ADA certified by IAPMO (International Association of Plumbing and Mechanical Officials). Original IAPMO Certification Results Aquassure’s top quality tubs are manufactured in North America with Canadian parts and engineering. We provide full pricing, specifications, and installation support– ask us today for a custom quote and full product specifications on any of our models and options. We have nothing to hide. Our showers have a 30 year warranty and our slide-in and walk-in tubs have a lifetime warranty on the door seal! Aquassure products are available for purchase in the US and Canada, either through direct sales from Aquassure or through local retail dealers, where available. Note, our prices are in Canadian dollars on our website, but US dollar price quotes are available by phone or email. Please contact us for international purchase inquiries from other countries. Our premium bathtubs have options such as heated air and heated water hydrotherapy systems, anti-scald, fast fill thermostatic mixing valves and automatic ozone disinfection systems. All of our premium walk-in tubs have heated seats available as options! Our bathtubs and showers are designed to be easy to enter, easy to exit, and have easy to operate fixtures. Aquassure’s barrier free showers allow safe step entry using a walker, and wheelchair roll-in access. All our showers and tubs are made for trouble-free quick installation, with complete phone installation support and documentation. Our products are certified, meet or exceed code, fully warrantied and made to last. Our customers love our tubs, showers and bathtubs, and rave about the quality, safety and comfort. 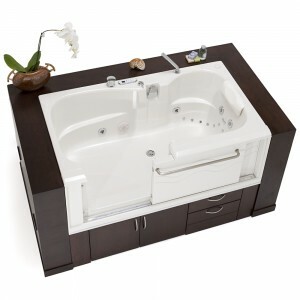 Experience luxurious bathing again with our in-home spa systems! Trusted by those who know. Aquassure stands behind its products, as our BBB rating shows. We are not just a nameless internet presence; we have a showroom and physical location where real people answer the phone. Our bathing products have been sourced by government departments in the US and Canada, as well as hospitals, insurance companies, assisted living homes, group homes and non-profit housing programs. In BC, we have installed numerous accessible tubs and showers under BC Housing’s HAFI program, Workers compensation and Veterans Affairs. Our slide-in bathtub, marketed under the names ADL Spa, and Active Daily Living Tub, is the signature Aquassure tub that started it all, featuring all the comfort of laying back and soaking in a traditional tub, plus all the safety features of a walk-in tub. Its sit-and-slide ease of entry and non-clinical aesthetic makes it a prominent favourite among clients and caregivers alike. 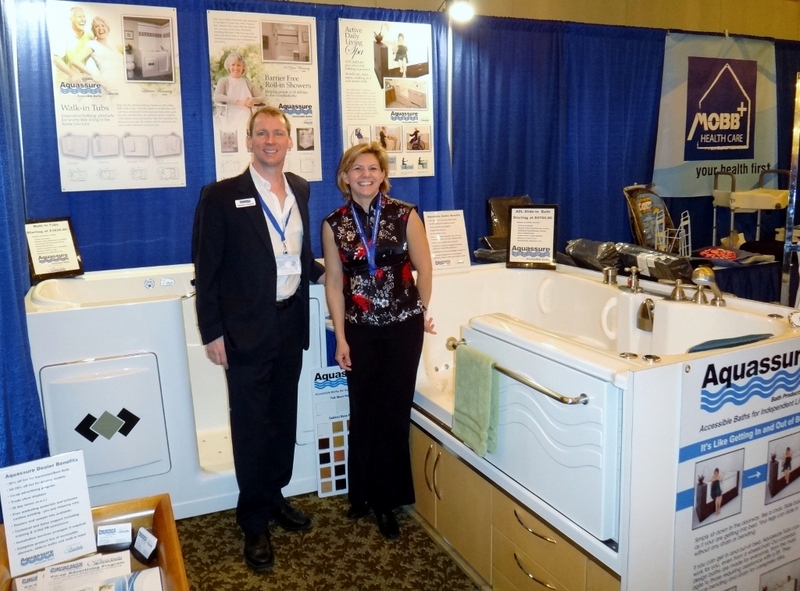 Aquassure distributes the Bestbath product line through many independent health care retailers across North America. These distributors are an integral part of our business, acting as an informed point of contact for anyone interested in an Aquassure bath system or in our shower or walk-in bathtub lines. Some of our distributors provide installation, sales and support and others are product retailers only and you will have to use your own contractor/renovator/handyman for the installation. Find an Aquassure distributor near you. Contact us to find an installer near me. Contact us for information on how to become a dealer.